This Financial Reporting Alert has been updated to reflect the SEC’s issuance of Question 105.09 of the Exchange Act Forms Compliance and Disclosure Interpretations (C&DIs), which clarifies that the SEC staff would not object if a filer’s first presentation of changes in shareholders’ equity is included in its Form 10-Q for the quarter that begins after the effective date of the SEC’s final rule on disclosure simplification. See the discussion in the Effective Date section below. As discussed in Deloitte’s August 28, 2018, Heads Up, the SEC has recently issued a final rule1 that amends certain of the Commission’s disclosure requirements “that have become redundant, duplicative, overlapping, outdated, or superseded, in light of other Commission disclosure requirements, [U.S. GAAP], or changes in the information environment.” The financial reporting implications of the final rule’s amendments may vary by company, but the changes are generally expected to reduce or eliminate some of an SEC registrant’s disclosure requirements. In limited circumstances, however, the amendments may expand those requirements, including those related to interim disclosures about changes in stockholders’ equity and noncontrolling interests (hereinafter referred to as changes in stockholders’ equity). This Financial Reporting Alert is intended to clarify the final rule’s requirements related to (1) disclosures about changes in stockholders’ equity in interim periods and (2) its effective date. Under the requirements in SEC Regulation S-X, Rules 8-03(a)(5) and 10-01(a)(7),4 as amended by the final rule, registrants must now analyze changes in stockholders’ equity, in the form of a reconciliation, for “the current and comparative year-to-date [interim] periods, with subtotals for each interim period.” We believe that a registrant should therefore include a reconciliation for the current quarter and year-to-date interim periods as well as the comparative periods of the prior year (i.e., a reconciliation covering each period for which an income statement is presented). Note that both rules refer to Rule 3-04 for presentation requirements, which, among other items, include a reconciliation that describes all significant reconciling items in each caption of stockholders’ equity and noncontrolling interests (if applicable). Rule 3-04 permits the disclosure of changes in stockholders’ equity (including dividend-per-share amounts) to be made either in a separate financial statement or in the notes to the financial statements. See the appendix below for examples of two financial statement presentation options for these interim disclosures. The final rule is effective for all filings submitted on or after November 5, 2018. After issuing the final rule, the SEC published Question 105.09 of the Exchange Act Forms C&DIs, which provides some relief to registrants that file Form 10-Q shortly after the final rule’s effective date. It clarifies that the SEC staff would not object if a filer’s first presentation of changes in shareholders’ equity is included in its Form 10-Q for the quarter that begins after the final rule’s November 5, 2018, effective date given that date’s close proximity to the filing date for most filers’ quarterly reports. A December 31 fiscal-year-end filer does not need to disclose changes in shareholders’ equity in its September 30, 2018, Form 10-Q. A June 30 fiscal-year-end filer does not need to disclose changes in shareholders’ equity in its September 30, 2018, and December 31, 2018, Form 10-Q. In addition, the filer should include changes in shareholders’ equity in its March 31, 2019, Form 10-Q. As a result of the final rule’s amendments, an analysis of changes in stockholders’ equity is required for “the current and comparative year-to-date [interim] periods, with subtotals for each interim period.” We understand that a registrant may use either of the two presentation options below to satisfy this requirement for interim periods reported on Form 10-Q, although there may be other acceptable options. In the two options below, it is assumed that Company A (1) is a calendar-year-end registrant and is in the process of filing its Form 10-Q for the third quarter of 20X9; (2) has only one form of common stock outstanding and has declared dividends in each quarter; and (3) has a less than wholly owned subsidiary that is capitalized only with common stock and therefore presents a column for its noncontrolling interest.5 In addition, for illustration purposes, the reconciliations are presented only for the applicable September 30, 20X9, period(s); however, a similar presentation would be required for the comparative interim periods in 20X8 as well. 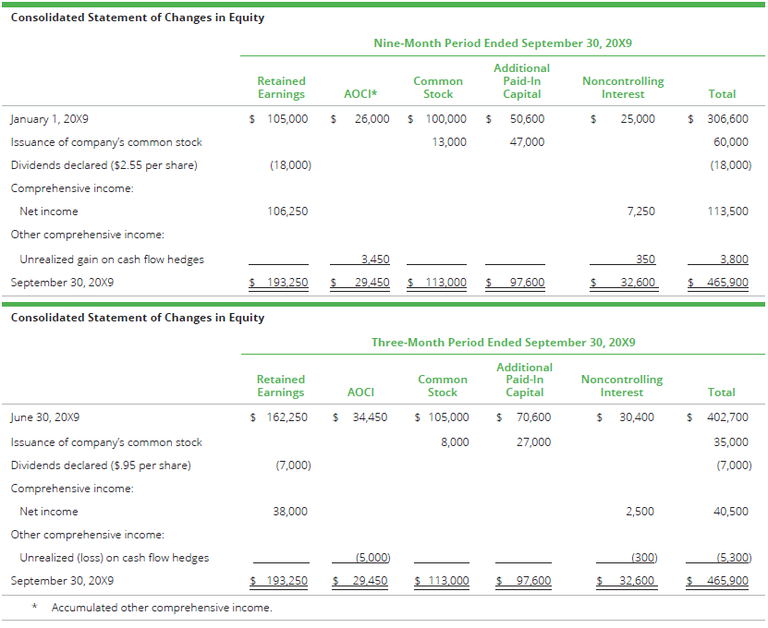 Company A may present two separate reconciliations: one showing the changes in stockholders’ equity for the year-to-date interim period ended September 30, 20X9 (excluding quarterly subtotals); and a separate reconciliation showing the changes for the most recent quarter-to-date period ending September 30, 20X9. 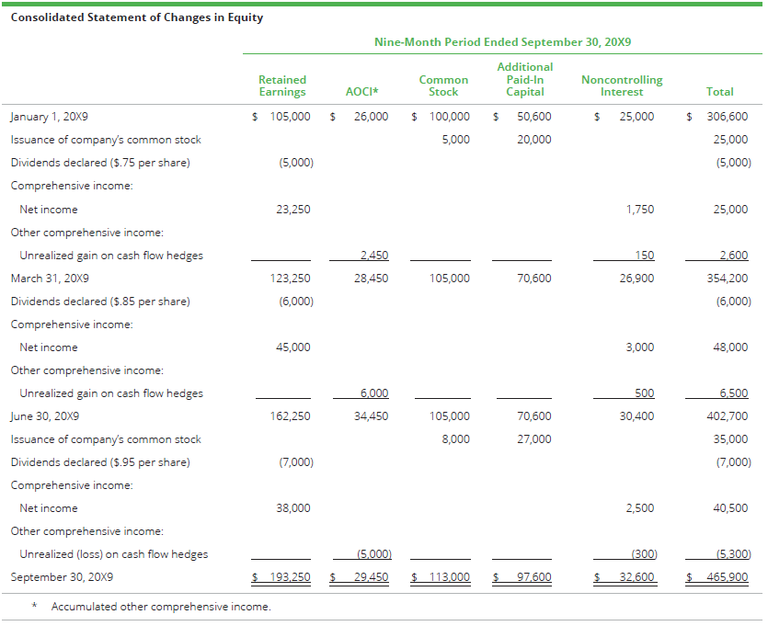 The reconciliation could be shown in separate financial statements (as presented below), the notes to the financial statements, or a combination thereof. Company A may present a reconciliation in a single statement that shows the changes in stockholders’ equity for the year-to-date interim period ended September 30, 20X9, which includes separate subtotals for each interim period. Alternatively, the single reconciliation could be shown in the notes to the financial statements. 1 SEC Final Rule Release No. 33-10532, Disclosure Update and Simplification. 3 FASB Accounting Standards Codification Topic 810, Consolidation. 5 The requirement to present changes in stockholders’ equity would also apply to registrants that do not have a noncontrolling interest.